Greetings everyone! Today I would like to share with you a channeling that I have received from AA Metatron called Expectation vs. Intention. Following the channeling I will share a very important guide with you on how to attract abundance into your life. “It is through INTENTION rather than EXPECTATION that you create the reality of your BEing. It is through the power of your mind, the power of your thinking process that you are able to fully coherently and cognitively co-create a new platform, a new reality of informational encodings. It is through YOUR endeavors that you incorporate the pure frequencies of the new world. It is through finding the BALANCE within, and it is through your patience with self, through your determination to strip naked before your very own self, getting to point ZERO that you shall be able to set yourself free. Free from restrains and outdated programming. Free from all that you believe you should be, for what you believe completely and fully forms your cognitive experience, the experience of the NOW moment in time. And so, it is imperative that you INTEND instead of EXPECT for various outcomes to manifest. For expectation is nothing more than admittance of self-limitation. For when you EXPECT a certain outcome, you expect it from the perspective of DIFINED objectives based solely on the five senses that you are equipped with, whereas INTENTION utilizes ALL senses at your disposal, by attracting various frequencies to swirl in specific formations in order to deliver that which you wish to experience, whilst setting no boundaries and no set agendas or expectations, allowing one to fully and cognitively exit “the box” and explore the world unbeknownst to you prior. It is through your INTENTION that you are able to leave the past, fully and completely release yourself from outdated modules of thinking, and align yourself with a new path. A path leading to freedom from mathematical formulas that no longer work in your new world. A path where the beat of your heart, and the signature of your soul are the deciding factors in your creative birth of a new sphere of influence. And so, remember to INTEND that which you wish to manifest in your world. Let go of all expectations, free yourself from the binding laws of outdated objectives. And walk confidently onto your path, ALLOWING it to lead you through the murky waters of the past, turning obstacles into grand opportunities for growth and morph that which no longer works into that which does. INTENTION = ENERGY/PASSION = ACTION = OPPORTUNITY = THAT WHICH HAS BEEN INTENDED. To intend is to CREATE and grasp the outcome which is intended for YOU – BY YOU! In this new reality that we have entered into just recently it is important to change our belief structure. I have been talking about letting go and reprogramming your mind for years now. Today though I would like to remind you about CREATING a different reality for yourself through your BELIEF. The #1 thing that I want you to understand is that all the stories of LACK in this world are FALSE, simply and completely false. Because in the universe and this planet specifically there is ABUNDANCE which is yours for the taking. #2. 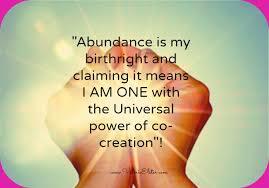 It is imperative that you fully tune into the following sentence “ABUNDANCE IS YOUR BIRTH GIVEN RIGHT!”. Because it is so! 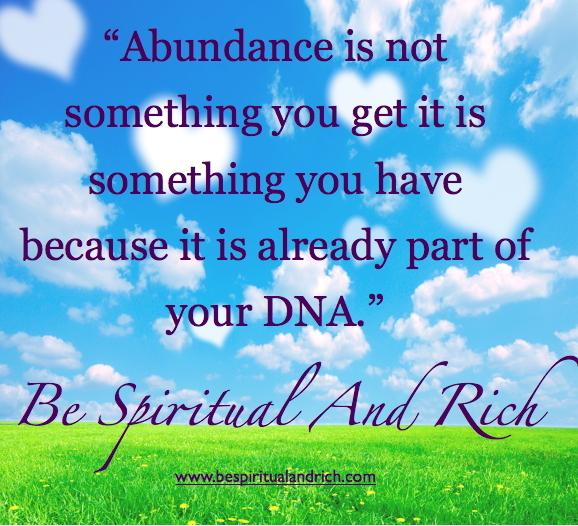 You are born to be abundant! 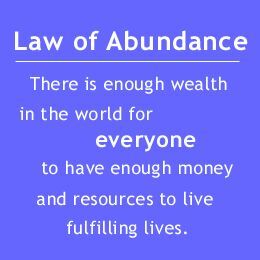 Abundant in whatever you wish it to be, whether it be health, money, joy, love, or the opposite of the scale, suffering, sickness, etc., it is completely up to you. One thing is for sure ABUNDANCE IS YOUR BIRTH GIVEN RIGHT! #3. There are elemental beings that are assigned to you when you are born, these beings take your thoughts and energy and automatically begin to create whatever you are thinking about into your reality. Whether they agree with it or not, it is their job to assure that whatever you are thinking of will come to pass. THAT is why it so SO important to monitor your thoughts! Because if you BELIEVE that there is LACK in the universe, you will fear that there is not going to be enough for you to manifest what you want. If you believe that you don’t deserve whatever it is that you want or have, rest assured that your elemental guides will strive really hard so that you will continue to experience LACK. However, if you BELIEVE THAT YOU DESERVE TO BE ABUNDANT in whichever way you want it to manifest, THAT is what you are going to experience. #4. Think of it this way, imagine that there is a road which is filled with agony, frustration, a feeling of lack, hard work, suffering, where everyone is barely surviving all because they are under this assumption that the only way to have anything good is to suffer for it. Imagine this road and now imagine that there is a road that exists just a few feet above the first one. On this road everyone is happy, joyous, doing what they love to do, healthy, vibrant and abundant in everything that they wish to have. Now imagine that you have found a staircase which leads up to a door that you unlocks with a very special key. And once you have that key, you can WALK THROUGH THAT DOOR, and find yourself on this beautiful amazing road of SUCCESS, ABUNDANCE, LIGHT, JOY, PEACE, HARMONY. All you need is that one key which will open all of these treasures for you. #5. That KEY is WITHIN YOU! That key is called YOUR BELIEF SYSTEM. The only thing that separates you from stepping onto that new path, onto the new 5D earth that has already been created, is your belief that somehow you aren’t deserving of this beautiful experience. Thus, in order to generate that key, you must fully and completely without any doubts in your mind BELIEVE that you are ABUNDANT and DESERVE to have EVERYTHING THAT YOU WANT! The KEY is to INTEND instead of EXPECT certain outcomes. Because when we EXPECT we are bound to be disappointed simply due to the fact that when we set an expectation in our minds, we see it coming to life in a certain way, and when something else appears on the horizon, which eventually will lead us directly to that which we’ve envisioned and intended for ourselves, we won’t give it a try, but stop ourselves from moving forward all because what will begin to take shape will not meet our expectation. Were we to INTEND without EXPECTING we would forgo the odd shape and allow the experience to blossom fully into what we have been wanting to experience. 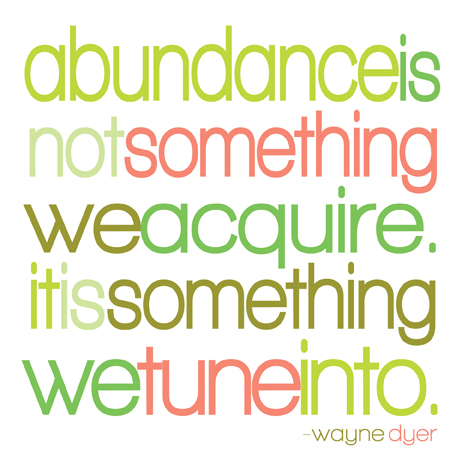 HOW TO ATTRACT ABUNDANCE INTO YOUR LIFE. The difference between those who are successful and those who are not, is not the amount of money that they start out with, it is not the education, it is not any of the external factors, it is the ability to TRUST your own self, and BELIEVE in your own ideas and ALLOW the success to freely come your way. There are hundreds of thousands of books written on this topic, however, I will only speak from my own experience. There is absolutely NOTHING that is stopping you but YOUR OWN SELF. The idea that someone is to blame for your circumstances is futile. It does not work, it never did and it never will. Blaming others be it your parents for not giving you enough education, your boss, your wife or husband, your friends and even the government will not do ANYTHING good for you. You will continue to marinate in a jar filled with doubts, fears, hatred, anger, despair, etc., and is that really what you want to keep doing for the rest of your magnificent life?! I say NOT! I say it is time to take back YOUR POWER. It is simply FALSE that there is something that you cannot do, everyone is capable of achieving that which they have come here to do. You have absolutely NO EXCUSES to not succeed in what you have come here to do, unless of course your journey does not involve success and freedom, but suffering and pain. Though, that doesn’t seem likely as you wouldn’t be reading this here article right now. STEP 1- UNDERSTANDING: So, having said that, lets get down to the steps you need to take. The number one rule of welcoming anything into your life is to understand this fact : ENERGY FLOWS WHERE YOUR ATTENTION GOES. THE UNIVERSE DOES NOT UNDERSTAND THE DIFFERENCE BETWEEN WHAT YOU WANT AND WHAT YOU DO NOT WANT. Whatever you focus your attention on is what it will deliver to you. If you sit there for example and fret that you don’t’ have money enough to pay for this and that, the universe will work really hard to deprive you of any further income, because it thinks that this is precisely what you wish to experience. If you have put yourself into a state where you constantly think that you cannot afford something you will end up living this way for the rest of your life. You MUST CHANGE YOUR THINKING! That is not to say that you should run out and start buying expensive items that you want. But that is to say that your THINKING must change in regards to money. If money is what you are looking for then you should focus on the fact that money is very easy for you to receive, that you CAN afford to get this and that item, you simply CHOSE not to do so for the time being. Metatron’s Clearing & Protection Device – As told to me by AA Metatron – Activates automatically at 11:00 a.m. and 11:00 p.m. everyday drawing source energy into itself and then dispersing this energy to you evenly throughout the day. It protects up to 13 feet of space in every direction, remember that your own sphere of influence is 18 miles in each direction and coupled with this tool you will amplify this energy creating a vacuum of clearance which will expand exponentially. STEP 3- ACTION, once you set in your mind what you want, you now know that there’s a tiny little bridge for you to get there, you just need to pull it to you, just close that gap. In order for you to get there, the universe will conspire to make it happen. YOU MUST START PAYING ATTENTION TO SYNCHRONICITY.. meaning, if you are sitting by your computer reading this, and all of a sudden you see that something is happening outside your window and you FEEL the PULL to quit doing what you are doing and run to the window and take a look or walk outside even if it seems ridiculous to you, you should take that step. The reason? Simple.. perhaps at that moment in time with the same pull another person who is the link to your success is also going to be there, you two will meet and this piece of your success puzzle will be complete and you’ll move onto another. Take every opportunity that life presents to you, don’t over analyze anything, follow your intuition and your heart, even if it seems strange and odd, even if you’ve NEVER done this or that before, none of it matters, just the mere fact that you are being drawn to do so, is the indication that you are on the right path to your success. STEP 4: LET GO, ALLOW AND KEEP WALKING – THERE ARE NO OBSTACLES ONLY OPPORTUNITIES. Even if at first you are up against what seems like obstacles to you, even if there is something that is not going quite right, don’t look at it as obstacles but opportunities, clearly the universe is stirring you in the right direction. If however, you feel that your project is exhausting you and you are really not happy with it, you should not proceed. In order for anything to be successful you MUST be fully and completely IN LOVE with this idea, you must enjoy it, if you do not, then it is not for you. If on the other hand you are exhilarated by your adventure then do not give up even in what seems like “dire” circumstances but seek out innovative ways of getting everything done. And remember, you already achieved everything you ever wanted, remember that there are infinite timelines that are running parallel to each other, where everything that you wanted has already manifested itself, the point now is to MERGE with your OTHER self CONCIOUSLY and walk on the path of success. LIKE attracts LIKE and you are to remember that what you feel and think.. is EXACTLY what you will get from the universe. So monitor your thoughts carefully get rid of limiting ideas about yourself, about others, about the world, see everything as a gift and recognize the divinity of everyone involved in your project, understand that you are never doing anything on your own, you are always and constantly supported by the universe and all the living beings around you, even this articles is here to support you, and you will be on your way to incredible success. No matter where you are in life YOU ARE IN CHARGE!!! “And so, first let us take you back in time to when you were a child, we are going to ask you to do something with us, for that you must fully and purposely connect with the divine in order to bring back the information that you are fully aware of, look into your heart and relax, sit down and breathe deeply, now close your eyes and think of when you were seven years old, what do you see, who are you, what are you doing, what is on your mind, what are you passionate about. Remember what you are feeling, seeing and sensing, now open your eyes and write it down. Now that you know exactly what you have come here to do, and you have remembered what it is that you wish to be, it is now time for us to take you into the future. We ask that you sit down again and visualize your future, completely as you wish it to be, fully connect to yourself in the future and see how do you feel being in a position that you have imagined for yourself. Are you happy leading the type of life that you are desiring at the moment, are you fully connected with the divine, are you feeling that you are indeed fulfilling your life’s mission? If so, if you are completely at peace and happiness then you have found your new vocation. Now, with all your might, with all of your intention think to that moment, remember it and carry it within your minds eye for the next 2 weeks. Savoring every moment of your new life, remembering it, sensing it, feeling it, living it in your minds eye. Put all of your concentration efforts into being at that moment in time, focus all of your attention on the moment that you are finally living out your dream. Think only of what you WANT and not what you don’t want. Remember the universe does not understand the difference between what you wish for and what you wish to avoid, all the universe picks up is that you are concentrating your mind on a particular idea, and it will quickly jump into action in order to manifest it into you reality. And so, after two weeks, you are to completely LET GO of this idea. Allow it to float out into the universe into space, to GOD to Your own higher self and relax knowing fair well that from this moment on, everything that will be happening to you is only going to be brining you closer and closer to your dream. And now… ALLOW.. allow us to do the work for you, allow us to present you with a variety of circumstances and opportunities for you to quickly get to that future that you have envisioned for yourself. BELIEVE.. that everything is possible, truly and completely with all your might believe it. ACT.. Now that you have put all of your ideas out into the universe and you are completely open and ready, you are to ACT on the opportunities that will be presented to you by the universe in order to get you where you wish to go to. Look for synchronicities, listen to the gentle universal flows, hear the melody of abundance that unfolds before you. Understand that EVERYTHING that happens in your daily life is happening indeed for one, and one reason only to help you arrive at the destination of your dreams – ABUNDANCE. This is INCREDIBLE !!! I do my “homework” every morning (almost :-)), which is a meditation. One of the first “moves” that I do within this meditation is to REQUIRE the cleansing and purification of my entire being – logical, wright ?! We all do that. Well – and here comes the miracle – today I surprisingly found myself affirming that I AM pure and clean, that my presence IS a sun of purity that cleanses everything and everyone around. Well, I was pretty surprised of my affirmation and my first reaction was to “correct” myself into a more humble “I wish to……”, but than I thought “no, I’ll let trust my inner self. I’ll accept this act of courage. Yes, I AM …….”. Of, thank you Anna ! Thank you Metatrone ! What a wonderful Synchronicity happens with the Arrivial of this challened focus, Metatron has gifted us this moment through you! It brings an important puzzles, that allows me that confirmed a very IMPORTANT viewpoint, that allows to really being able to create, manifest blessed, unlimited reality and following a new, fresh path without "hanging" here and there in believe structures, that I am aware of, but havn`t fully REALIZED TO THE CORE although I am circling very close around them by exploring them deeper along with according experiences in my life and the conscious inted and effort to CHANGE THEM'ir / and release them / letting go the "grip" they had on my BEHAVIOUR (having getting fix in so many,, many experiences this and other life times), why I have PLACED MY FULL ATTENTION on them, on the effort to clear them to the root, Core. During this intense, powerfully time of September equinoxes YOUR FOCUSSES and ASSISTANCE and PRACTICALLY HINTS were of great Support for me, because they HAVE FIT INTO MY OWN EXPERIENCES. Thus I am very thankful for these "gifts and support of Heaven and Earth", delievered by Archangel Metatron and YOU. They have MET MY INTENDS while I became aware at once the "fruits" of the behaviour of EXPECTATIONs ( that create limiting results) because of the FIX nature. In such this article and viewpoint shared today with us, HAVE ADRESSED FULLY CORE themes, focus point, "that have burned", that gives as well as gifts me now with a deeper understanding and the ABILITY TO APPLY IT "MORE" FULLY till the point, where I will experience the FULL labours of CREATIONS, released from UNLIMITED BELIEVE STRUCTURES (on which I have put much clearing efforts the last two years especially). I know always deeper and clearer how we create our reality by experiencing it consiously, a limited one so far – what opens the door (FULLY) with the key given to be able to manifest vice versa also an UNLIMITED; ABUNDANT, EASE new one. All of these thought processes and focus points my processes of understanding circling now, what is mirrored by YOUR VIEWPOINTS, articles. And I feel EASED! Gladly I would have shared these CORE-EXPLORING- EXPERIENCES- and INTENDS with someone "in person" in my life to make it clearer , fix the "stumbling points" where I have MET OLD BELIEVE – and mostly BEHAVIOURS STRUCTURES to be able to TRULY create / release new unlimted pattern and exprience a change on physical plane too and walk a new path, thus create THE CIRCUMSTANCES "INTENDED" and not only EXPECTED, thus experienced as "mis-creations" , why I have searched intense to "become aware" more clearly on this behaviour. Till now, today with receiving Metatrons Message and your one one, I couldn`t give these mis-creations a name although I have tried to "shared it with some", but they didn`t understand me, even I could not make understandable me. What a Luck TO MEET MY INTENDS in THIS WAY HERE, TODAY and in the ways shared so far. My intend is so big, to walk TRUYL A FRESH, UNLIMITED and ABUNDANT PATh and to clear FULLY old behaviours (relating abundance that came in my focus now also along with the impact of the last eclipse energies), that it seems to become obviously with the support of the co-creation with the Higher Realms of Light and DivineSelf, that Synchronicicties arrives me / all of us in a big speed, even immediatelly now. NEW PATH . As I havn`t found someonet o speak with PERSONALLY, I have used articles, clearing tools to getting to the BOTTOM of my issures – with sucess, always more, like the EXPERIENCE today, that has gifted with with A MIRROR and SUPPORT by and through YOU! This shows me: I begin truly to create from a (more) cleared bellieve-behaviour level and all my efforts (a life long) succeeding. I was always drawn to your abilities to assist in bringing through WISE AND CLEAR INSIGHTS, FOCUSSES AND MESSAGES and also tools (recommended as Discs) although I "felt not abundant enough" to could accept them, "order" them because I struggled still with LACK (the whole of my life) and also TRUST, rooted in repeated experiences of hurts. Now I don`t have the old resonance towards ATTRACTING HURTING CIRCUMSTANCES AND RELATIONSHIPS and begin to re-cover relating Trust, what is a KEY ELEMENT too of course besides the placed clear intend. THANK YOU VERY MUCH, THAT YOU ARE PART OF MY LIFE, MY NEW CREATIONS; FOCUSSES and also INTENDS as well as relating a deepened understanding, that we can apply in daily life, mirrored by your precious contributions in many forms! annamerkaba posted: "Greetings everyone! 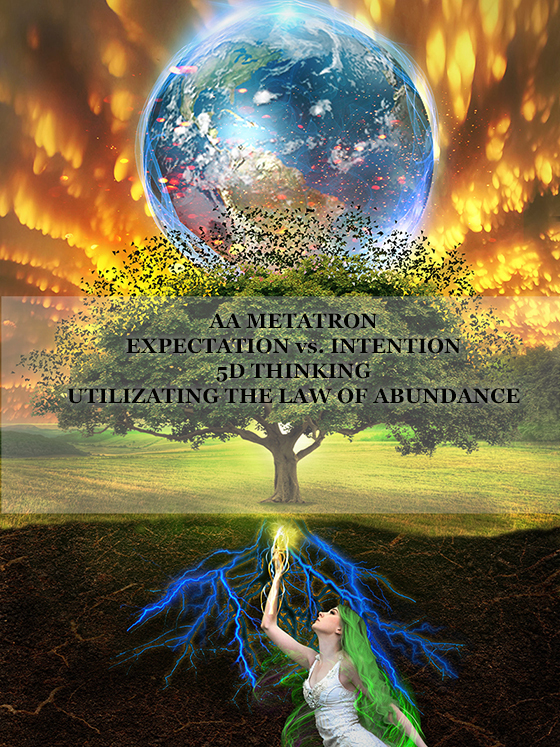 Today I would like to share with you a channeling that I have received from AA Metatron called Expectation vs. Intention. Following the channeling I will share a very important guide with you on how to attract abundance into your life." A wonderfully grounded and tremendously helpful spiritual post by Anna Merkaba. It speaks plainly to our situation and heals a common misconception. I have really missed these sorts of posts! The Global Wide Celebration Begins Here NOW ! At The Speed Of LOVE ! There’s one question I keep coming back to. What if one’s soul doesn’t want to experience abundance and freedom in this lifetime? I want to be free from needing to work for money and for someone. But what if my higher self thinks it best for me? Then can I intend that? I was hoping you could answer these questions for me. My dreams have become very vivid, interactive and multi-dimensional. I often drift in an out of consciousness while sleeping and I experience my physical body in bed while my energy/spirit body are elsewhere communicating and experiencing other beings and places. My Pineal Gland is very active and many times I awake with images, messages and light in my 3rd eye. Also upon becoming fully awake I am still connected to that experience and I continue to gain knowledge about that experience. My question to you is this, Are you aware of any groups, organizations or individuals who could help me understand the knowledge and teach me how to communicate better? More so, do you know of any organizations who may have studies or research programs on this matter. Thank you for your time and I always look forward to your post and messages from you and your guides, angels and other beings communicating with you. Metatron can connect directly with any of us, without channeling. It’s a little strange that you have to channel to understand basic spiritual principles. I’ve seen AA Metatron, when I needed to. But honestly, the whole planet will ascend. People worry so much about ascension. It’s a natural process. There are those who’ve done the spirit work and are closer to enlightenment, yes. But the notion that some will ascend and others won’t, It’s not right. Be your own best psychic! You have your own answers! Trust! The only thing I want is for this insane control system to have been ended for everyone, and then I feel I can start thinking about what I want in life again, because apart from that I really have no idea what I want from or in this world anymore. In fact, the only semblance of want I feel I have… the only sense I have of possible excitement or fulfillment for the future… is that I want to be amongst the stars and communicate that experience. That’s all I feel.